Happy New Year--whoopee. It's another year, this 2012, but is it really a new year or just a continuation of the last one. I won't call 2011 my most stellar year by any means, but I wouldn't say it was any worse than any year of my life either. It was a good year, but not a very good year like in the Frank Sinatra song. It was and it wasn't and it wasn't it and it was. I'm still here, smiling and optimistic, always looking for a better tomorrow but doing my best to enjoy the day at hand. So what do we have to look forward to? I mean besides the presidential election for those of us in the United States. We've already had a whole year of this election circus, but now the big show is coming to town. Or shall we say the big show down? We've got ten months of political shenanigans to look forward to until the people's court decides who the next president will be. Then we'll get four more years of the people complaining about who they picked. No new news in politics probably, but we can hope. Then there's that end of the world thing. No, I'm not talking about that Reverend Harold Camping nonsense that we experienced not once but twice last year. And that after he pulled the same trick on his followers about twenty years ago. They should have been listening to the Who's "Won't Get Fooled Again", but instead they chose to sell all of their belongings to the tune of "Ride That Glory Train". The end that I'm talking about is the Big End predicted by the Aztecs. It's all gonna come crashing down on December 21, 2012 if we are to believe those guys. Of course those guys are all dead and gone and won't even get a last laugh--or will they? Maybe those High Priest Aztecs are still alive like vampires, having cut out all those hearts and probably drinking blood and all. Yeah, if the world ends we can blame it on them with all their weird and evil primitive practices. I'm not worried though. We always seem to survive the crappy presidents, false prophets, and even the zombie Aztecs, and manage to stumble through the current year until we go crashing through to the next. We've got book releases to celebrate, blogging milestones to cheer, and another round of Blogging from A to Z in April. It's going to be a good year, this 2012. No, I take that back. This 2012 is going to be a great year! The absolute bestest year ever! Yippee. What are you most looking forward to this year? What are you glad is now behind you? Do you think the Aztecs knew what they were talking about? I'm looking forward to reaching my 1 year blogging milestone, closely followed by the A-Z challenge. Oh, and hopefully a couple of kindle releases this year. The absolute bestest year ever! Yippee. - cheers to that! I had quite a good year travel and concert wise, but a great portion of the year was consumed with unhappiness about my health and eldest son. My health is now OK(Fingers crossed) but won't mention son. I have a holiday in Feb, but hope to spend a few days this month with son in Spain. hope the world is still here in Dec. Since 12-21-2012 is my nephews 11th birthday, we have assured him that the world will not be ending that day. Seriously, the poor kid has asked about it several times. I'm looking forward to some big changes this year. My husbands surgical repair for past illness and our big sun seeking project. Aha 12-21-12, pretty intense stuff! I hadn't heard about this end of the world prediction, but since the Bible says not even the angels in heaven know when Christ returns, I figure the Aztecs don't either. Happy New Year Arlee! I have to agree so much with this man. I mean, if I may put on my philosophical/pretentious hat for a minute, time is just a man made construct that we choose to adhere to, there's no difference between the 31st of December and the 1st of January, not really. With that said here's hoping 2012 is still a good one for you man, that end of the world stuff is disconcerting to say the very least. I'm looking forward to this year, there are the whispers of goodness floating about and I'm jumping about trying to catch them. Unfortunately for you I'm not managing to jump on the doom and gloom that you are predicting. I am looking forward to the A-Z where I found some great new blogs to follow last year and I'm looking forward to finding out where this year will take my characters in book two. Have a great year Lee. It is a new year but the same stuff. :) But I guess we can make the same stuff better. Ruts are my trap because they are safe, but I get stuck. That's never fun. Laura -- I agree that it's better to savor life than waste time worrying about it's end. There is too much to enjoy about right now. Yvonne -- Let's hope you have some turn-arounds in your life and have a great year that propels you forward to the next. Jasmine -- What a burden for a kid to have his birthday on a "day of doom". But he sounds like a savvy kid and he'll probably make the best of it. Hoping for good things for your family. KarenG-- Exactly!!! I've got better sources to listen to than Aztecs or Mayans. Matthew --I'm not going to worry about end of the world predictions so I don't mess up the present, but it's interesting to hear about. Rebecca -- I didn't predict it and I'm not planning for it either. Like you I have to keep moving forward. Teresa -- Safe is the word. I've got to keep out of the ruts and stay on the right track. I am glad getting out of my house and into an apartment for a bit is behind me. I am looking for to serving our Lord and magnifying His glory as He leads and sees fit the most this year. No, most people have it wrong. 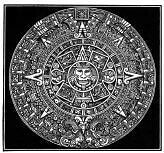 The Mayan calendar is like any other calendar to ever exist, on Dec 21, 2012 it will roll over to Dec 22 and renew like it has done before. They did not know anything that we don't know about God's timing to destroy this earth and recreate a new heaven and earth. You must have missed my post last week on this calendar. I showed how it worked and what it looked like in a post called Will the World End in 2012? Hope it is the bestest year for you. I look forward to getting some great writing in. I don't care if I'm published or not, I just want to be happy and keep writing. Everything has to end at some point in time, us, traditions, the world.... I guess the thing is to just enjoy what we have while we have it and not worry about the inevitable. It will come when it comes. It will be a great year! February 28 is a big date for me, but there's a lot of other things happening this year as well. And if the Mayans could predict the end of the world why couldn't they predict the end of their own civilization? I am looking forward to continuing my journey towards inner peace and healing. I never know where that will lead me. Right now it's getting back to a manuscript, some nonfiction pieces and my singing. Hope things look better for you, Lee, this coming year. I thought it was the Mayans; they only ran out of space on the rock! We'll be fine, unless we manage to kill ourselves fighting over crap at Walmart or accidentally-on-purpose set off some stupid bomb. My goals in 2012 are to blog more and get more focused. After all this time, I still don't have many readers or much to say. I want to finish my book and start another one. I want to sell at least one story. For money, not copies. And personally I would like to move. I hope the economy will support at least most of those goals. Gregg-- I saw where you posted about the Mayan prediction and meant to go back to read it since I already had this post scheduled. I wish you and your family well in the coming year. Miranda-- No, not boring at all. I couldn't ask for much more either. Delores -- You said it! Carpe diem but keep planning for good things in the future. Alex -- Touche! The Mayans/Aztecs should have been thinking of their own demise before ours. Karen -- I'm prepared for a good year and hope the things you strive for turn out well. Elizabeth -- Mayans is right--not sure why I wrote Aztecs since it was almost a month ago when I wrote this. I'm looking for the same kind of cash payment for my writing too. Let's hope it starts happening for both of us this year. Well, I certainy hope there's nothing to the Aztec prediction. Not only am I not done with the world yet but my grandkids certainly aren't. For myself, I'd like to make better use of this year. Feeling like I wasted too much of the last one. I'm most looking forward to the Summer Olympics!! They're in London this year and start on July 27. I like watching most of the sports, but gymnastics is my favorite. I'll be glued to the TV for those two weeks! I'm looking forward to doing more of the same from last year, but with less procrastination. One 'take' on this end-of-the-world issue is that it will herald the end of some world 'system' and the ushering in of something new - one person I know has postulated that it may be the end of capitalism and a greater awareness of the spiritual side of life. My plan for the immediate future is to try and make each day count, step off life's treadmill, 'do/make' more stuff rather than go out and buy it and generally try to ease my pace! We rush about trying to do too much and bent on reaching impossible goals. Life is a journey - I intend to take some time out to sit and enjoy the ride! LD -- I'm not done yet either and I too have kids and grandkids who want their turns. Trying to get the most out of each day is a good goal. Laura -- I'm sure many people will be keeping up with the Olympics. My mother always does. Cherie -- I hope I'm better about not procrastinating so much. Sue H -- I think some kind of change is coming, but I don't know about a complete end to the world. But I'm with you on enjoying the life journey that we are on. I'm keeping all this 2012 stuff simmering on the back burner while keeping a watchful eye on it. Could be the year we see things start to happen. I believe in the events of the book of Revelation and by golly by gum I do believe we're getting close. And I'm looking forward to the release of my book OPENING! Happy New Year to you and yours Lee! I kind of hope the world ends. That promised 1,000 years of peace is sounding pretty great right now. Hey Lee! I'm looking forward to this year and all that it will bring..as for this 'end of the world' thing...I think it's nonsense, pure and simple. I don't believe that any ancient culture had clairvoyant powers to that degree...or to any degree really. I don't understand people getting swept up in this nonsense...I think these are the same kind of people who drank poison and then laid down and waited for the Mother Ship which arrived on the tail of a comet...Happy New Year Lee!! I'm looking forward to doing that big blogging challenge again, this time for real! And since we don't know when it's going to be our last day on earth, we need to live each day to the fullest (corny cliche). As the song says, we need to "live like you were dying." As fascinated as I am with the end of the world (you've seen my book choices! ), I'm not putting my money on the Aztecs. I'm not all that worried about the world ending on 12/12/2012. Here's to a great new year for everyone! We were just reading about the way the Mayan/Aztec calendar worked in the newspaper (hubby likes reading those). I don't listen to predictions of the world's end, I prefer to listen to NASA or the Canadian Space Agency about meteors or plummeting objects entering our atmosphere. It's way more probable. Live every day like it's your last, right? I'm definitely looking forward to 2012, despite all the political rigamarole we'll be subjected to. This will be a great year in my writing! I'm determined! All those doomsayers trying to ruin our fun, lol. It'll happen when it happens. Stephen Tremp-- I'm with you on the Revelation scenario being the more believable. Emily -- That 1000 years is something to look forward to, not to mention an eternity to follow. Eve -- There are always those who are ready for a new doomsday prediction. Thea -- the Reverend's roof replacement was undoubtedly paid for by his followers. Kelly -- I'm not placing money on Aztecs, Mayans, or any other such culture. Kirsten -- I'm not that concerned either. Whatever happens happens. Suze -- I like the concept of the best is yet to come and I do enjoy Sinatra's music. DG -- Unless those Mayans were accurately tracking some celestial body and pinpointed collision come December. Highly doubtful in my opinion, but who knows. Raelyn -- That's a philosophy I can live by. Dezmond -- Maybe that's why the zombie rage--getting us prepared. Shannon -- I'm counting on the best in 2012. Donna -- Let's just keep making plans and if someone wants to spoil the party, well too bad--for us. Lee, I'm going to be posting many times about the 12-21-12 end of days theory. It is my intended theme for the Challenge in April. Looking forward to this year and especially Alex's book and the A-Z. Happy New Year, Lee! I like your philosophy of living each day...I try to do that as well. Stay in the moments. I do set goals though and this year, I am looking forward to writing more. Cheers to you and it IS going to be a good year! Happy New Year Lee! I am looking forward to 2012 and all of the 'new day resolutions' I am going to make. I tend to screw up on the New Year's resolutions so I'm taking a different bend on it this year. Looking ahead to good things - more writing and getting to share with great writers like you! Happy New Year! I'm not sure what I'm looking forward to, I kinda like the surprise prospect. And I don't complain about who is President; nothing new inpolitics just cuz the faces change. Keeping life easy, positive thinking, and full steam ahead into the New Year. I'm open to the possibilities it holds. Anyway, the lack of fear probably stems from disbelief of these modern day prophets and my somewhat optimistic personality. The politics this year... yep, it's going to be a circus. Maybe there'll be some entertainment in the process along the way. 2011 was an okay year; with the usual joys and hardships. I'm learning to roll with the punches. This year, I wish to be very productive and to experience the excitements of life - whatever it turns out to be on any given day. I think we had too many end of the world predictions...and then the fact remains that all good things and people have to leave this planet one day or the other...as for politicians, their promises are written on shifting sands. I bravely venture a happy, successful and complete year for you and your loved ones. I'm moving in a new direction this year and looking forward to having a few more books out there with my name on them. I am looking forward to some cool projects and writing more. I really looked forward to this year. I know it is just superstitious but last year sucked in a major way for me. Oh, I trudged on, but it was a toughy so I hope this one is different and will do everything I can to ensure it is! Like twirling around three times every-time I see a crow, or spitting over my left shoulder, or not opening an umbrella in the house - you know, just the regular precautions. I don't think anyone knows when the end will happen so I'm not worried. I'm ready for 2012 to be an awesome year! As I tell my students, I've lived through many ends of the world and I'm still here. Facebook had a funny Mayan calendar circulating. In the middle was Porky Pig, saying, "That's all Folks!" Last year was pretty good. I made some needed changes, wrote, and queried. I plan to do more of the same. 2011 was my most successful writing year yet. Let's see what 2012 brings. I wish you an even better year than the last! I thank you all for stopping by and leaving your words. I'm back on the road for the intense trek from Houston to Los Angeles by car. When I get home I may sleep for a day. Hi Lee .. Happy New Year and a very good 2012 to you and your family ..
A - Z will be wonderful once again .. looking forward to it .. and the end will come after your Challenge! So who worries?! Happy New Year Lee - all the best to you and yours.